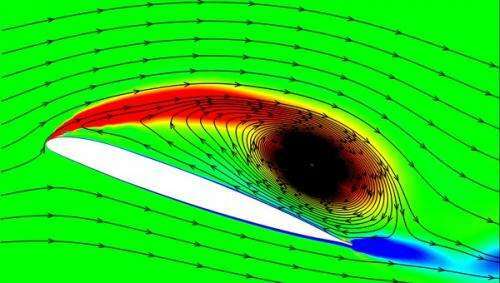 (PhysOrg.com) -- Whale researchers have known for some time that humpback whales are able to perform feats of underwater acrobatics that belie their huge size and that some of that ability is partly due to the bumps they have on the leading edge of their dorsal fins. Now, engineers at the DLR Institute of Aerodynamics and Flow Technology in Germany have applied the same idea to the leading edges of helicopter rotors and have found that doing so allows for greater stability and faster flight. In order to fly, helicopters have rotors that are tilted slightly upwards to create a wind foil, which in turn creates lift when the rotors are spun. The problem is that when the helicopter is moving forward, lift only occurs when the leading edge of the rotor is facing forward. As the rotor continues its turn it eventually winds up going backwards, which causes instability due to the vibrations that result as the opposing forces cause the rotors to spin at slightly different speeds. At high rates of speed, this can lead to stalling and possibly a crash. Because of this, helicopters can’t fly as fast as they would otherwise. To address this problem, the engineers in Germany looked to those bumps on the dorsal fins of humpback whales. The dorsal fin on a humpback whale is truly a powerful thing. Because whales are so big and bulky, they can’t use their bodies the way smaller swimmers such as dolphins and porpoises do, so instead, they rely on their tails to push them through the water and their dorsal fins to help them make relatively sharp turns. 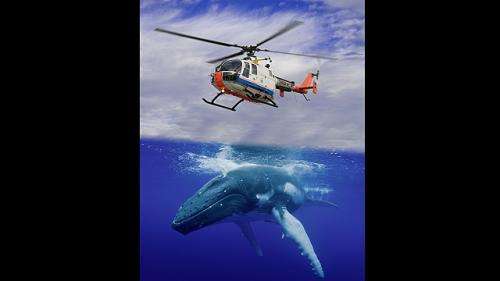 But like helicopters, they risk stalling and sinking if they try to swim too fast or turn too quickly. As humpback whales grew larger over many thousands of years, bumps on the leading edge of their dorsal fins evolved to help provide the continues lift needed to maintain stability. And now, modern engineers have found that copying nature’s design has led to increased stability in helicopters as well. To see if such bumps would help with helicopters, the engineers glued quarter-inch wide rubber grommets onto the leading edge of a rotor and tested the results in a wind tunnel; encouraged by the results they moved the testing to an actual test helicopter. The results were positive enough that test pilots immediately noticed the difference. Because of that the Institute has filed for a patent on the idea and if continued testing shows the bumps don’t cause any other problems, they will likely become a standard part of helicopter design in the future. Bump patent on its way! Pectoral fins, NOT Dorsal fins. Also, the fluid dynamics of these fins have been under study for years now with an emphasis on boat appendages. (I have been considering experimenting with my sailboat rudder to see if it helps reduce drag and increase control, but have to spend what little money I have on other things). At any rate, good on these guys for trying to apply it to helicopter blades. It seems to follow that it might increase efficiency in regular, boat or plane, props as well. As Cal_Sailor says humpback whales don't have dorsal fins. They are the "flipper" fins or, as he says, pectoral fins. Yes, this has been under study for some years already.